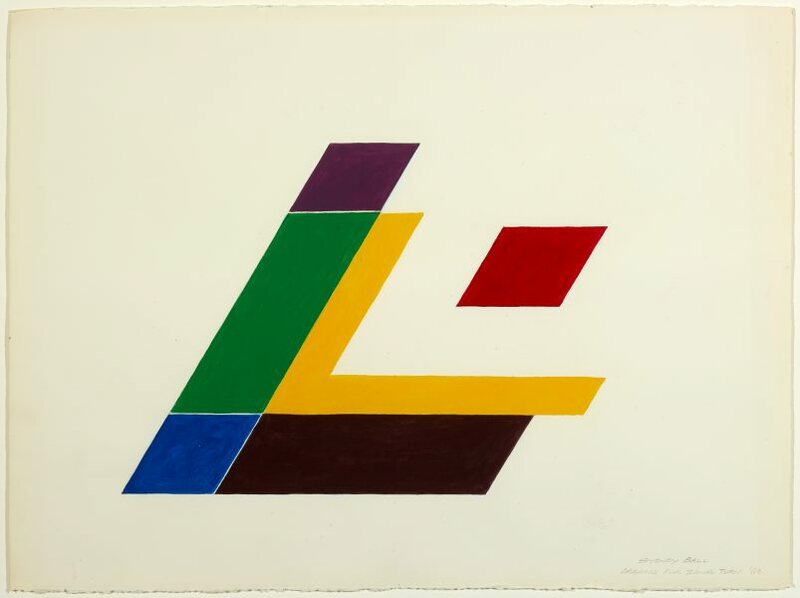 Sydney Ball was one of Australia’s leading colour abstract painters. Born in Adelaide, he exhibited his work in Australia and internationally from the early 1960s until his death in 2017. After graduating from the South Australian School of Art in 1963, Ball made the key decision to further his studies in New York, as distinct from the more conventional route of Australian artists who travelled to Europe. His exposure to American Abstract Expressionist painting in New York, where he lived from 1963-65 and 1969-71 had a profound influence on his work. These studies on paper were made in preparation for Ball’s ‘Modular’ series of paintings, made in Adelaide between 1968–69 and arising out of his previous ‘Canto’ series. The ‘Modulars’ juxtaposed shaped canvases in various arrangements on a white wall, continuing Ball’s exploration of hard edge colour and form through shaped canvases and their extension into wall-mounted composite geometric structures. Technically-demanding, the series required arduous technique, rare materials and custom-built stretchers, achieving a remarkable incorporation of sculptural form and space into the artist’s investigations of colour painting. Signed and dated l.r. corner, pencil "SYDNEY BALL/ ... '69". Sydney Ball: Modular and Infinex 1967 to now , Sydney, 2016, 12-13, 19-23.